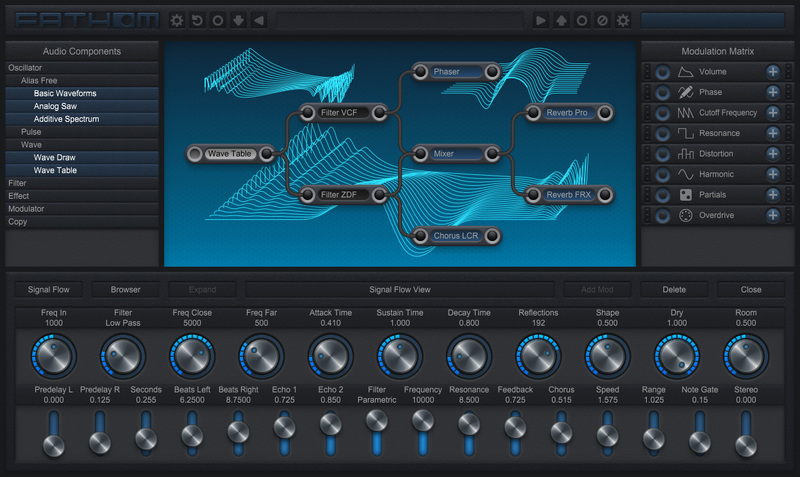 Fathom is a fully modular software synthesize which features free hand drawing and Bezier curve editing for all waveforms, modulator envelopes and LFO functions. Fantastic playground, endless possibilities, good price, great documentation and a freeware Mono-Version. I am really happy that I found that one. A fantastic synth at an absolute bargain price. Developer is incredibly helpful, great documentation and frequent updates. I have been using Fathom since it was first offered. I was impressed by its quality then and I am even more impressed with its constant development and its very talented and hard-working developer. Unless I am a very poor judge of character, the creation shares the virtues of its creator. By all means, try the free version and see if you agree. The depths of this synth are insane. From the eye candy GUI, to the 137 page E-book/PDF manual that this comes with it's clear that endless amount of thought went into this synth, and considering the constant updates it's clear they still are. Bravo. We don't need a million new synths. Just one, that's very good that get's updated consistently and made better. Do not know how many soft synths I have. I lost count. Numerous and soon forgotten ones. Some stand out from the crowd. I still use the old Powercore Virus, the relatively new Serum and Omnisphere is my all time favorite. Then Fathom came along. The mono version was free, so even if the closet was already full I thought I should give it a try. Free is free right? What first struck me was the unfamiliar interface. Why did they design it like that? I fumbled around with it for some hours and it grew on me. By the end of the day I was in love. I have never really gone into the programming part of a synth. It seemed so cumbersome. I relied on others to make some presets. But now....one after another. It was more like playing an old video game. Moving all the parts around, connecting them to hear dramatic or subtle differences. Fun! Here you are the hero of the game, producing incredible sound with all the impressive features, FX, knobs and curves. Well, a GUI is important but it does not make a synth. The SOUND makes a synth. And Fathom does not let you down here either. It is extremely seldom a free product sounds like this. It competes with the ocilators of my most expencive top notch synths. So both SOUND and GUI is GREAT, and did I say it was free??? Once again: The Mono version is free!!!! So free that I took 25USD out of my late granmothers wallet and bought the POLY version. 25USD!!!! For a top notch synth - incredible. I have played it forward and got more thanks than chistmas cards! (And I get a lot of christmas cards). If you are still wondering if this is for you, try out the free (I said it agian) version. I promise - you won't be going to bed the first three nights.